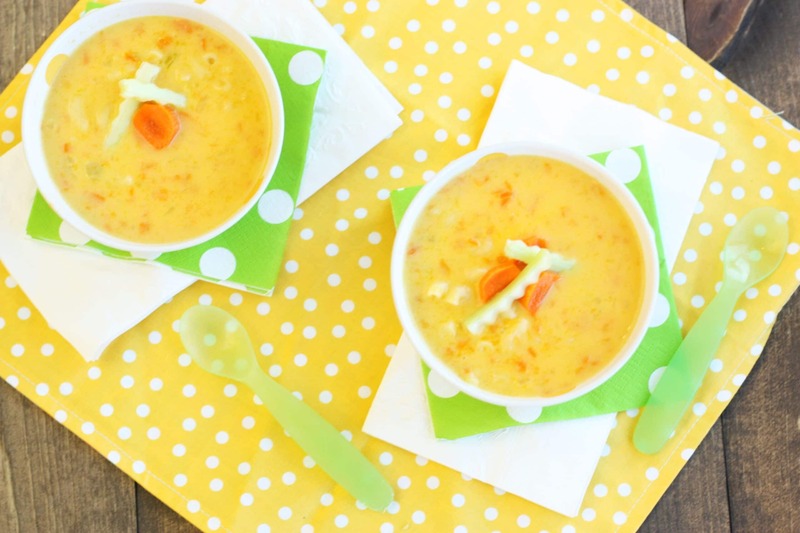 I’m not quite sure how Mac and Cheese became assigned to ‘kid’s food’, but if I would let my kids choose what they want to eat everyday I’m pretty sure we would be having Mac and Cheese for Every. Single. Meal. The boxed kind is quick and easy and maybe that is part of it, but I personally think that the taste and nutrition are about as good as eating the cardboard box it comes in. 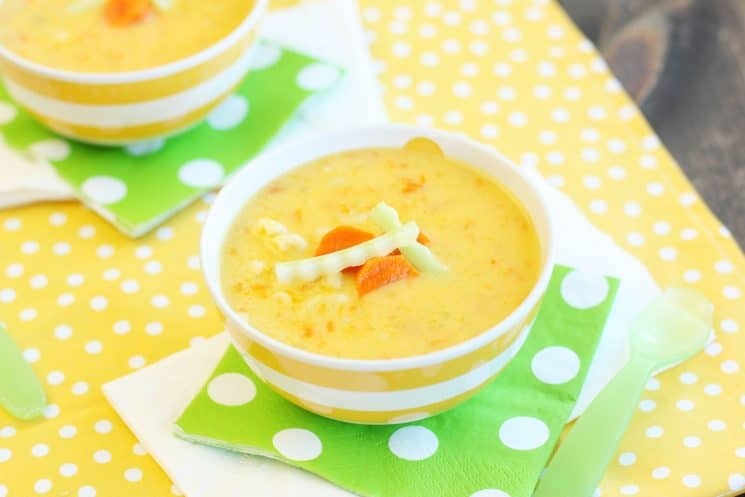 This Mac and Cheese Soup Recipe combines the comfort of a creamy savory homemade soup with the kid factor of mac and cheese, but the added bonus of veggies! The key to this recipe is to chop the veggies super small. I used my food processor which diced them super fine. So fine in fact that everything but the carrot literally disappear. 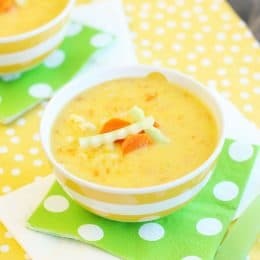 My kids love carrots and so they were fine having small bits of carrot in the soup. If you don’t have a food processor, you can dice them yourself and it should work just fine. After they are chopped, add them to a large saucepan. Sauté them until soft and then add flour and cook for a couple more minutes. Then add the broth and bring to a boil. In the meantime, shred your cheese and boil your noodles. 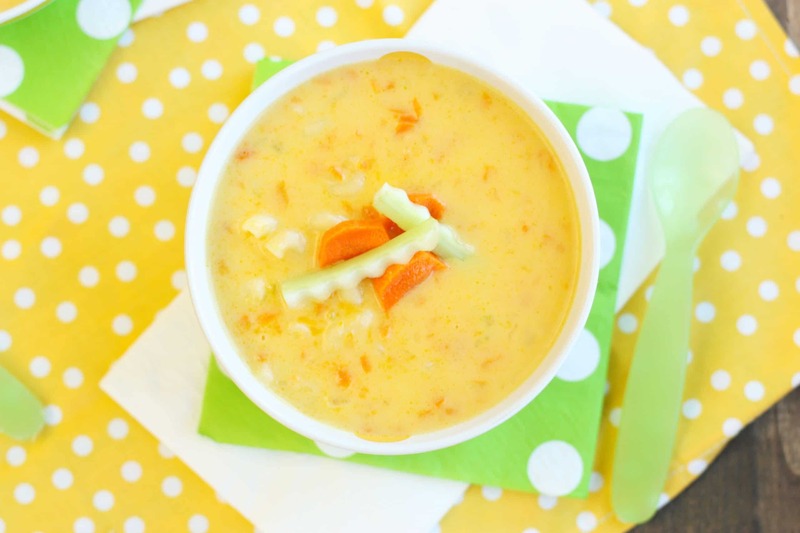 After the veggie mixture has boil and thickened (about 5-6 minutes), add the rest of your ingredients. Stir together until the cheese is melted. Serve warm! 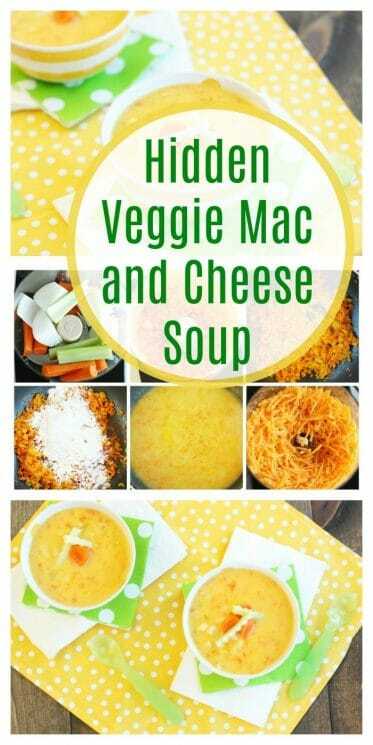 This soup makes great leftovers and thickens as it cools and so it is even more like Mac and Cheese. We used our crinkle cutter and cut the extra veggies we had into fun shapes to use for a garnish. 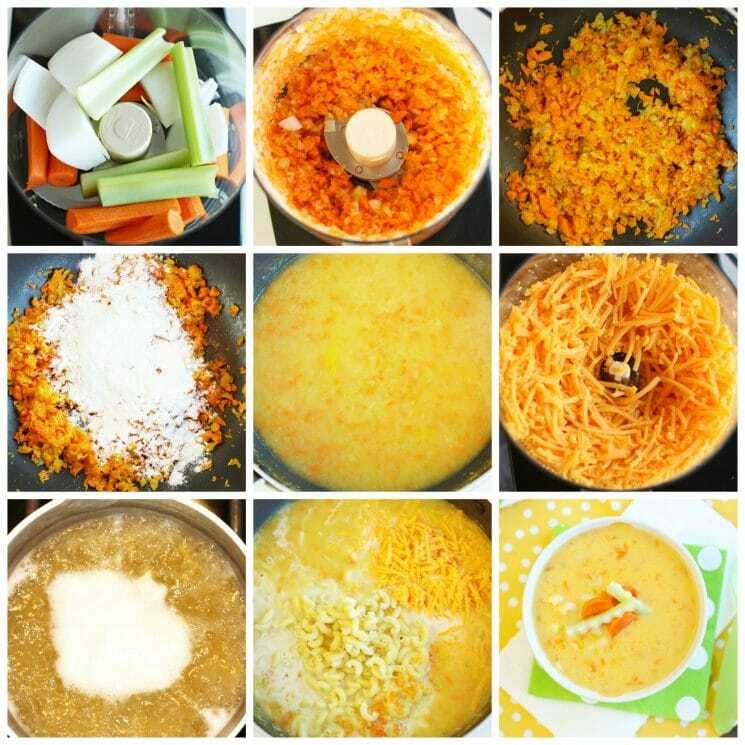 Place onion, carrots and celery in a food processor. Pulse until chopped very fine. In a large saucepan, add a small amount of olive oil. Add the vegetables and cook over medium-high heat until softened, 4 to 5 minutes. Add the flour and cook for another 2 minutes, stirring the whole time. Gradually stir in the broth and water and bring to a boil. Continue to cook, stirring, until thickened, about 5-6 minutes. Remove from the heat. While the vegetable broth mixture is cooking, boil your pasta according to package directions. Add the milk, cheese and noodles and stir until the cheeses melt. 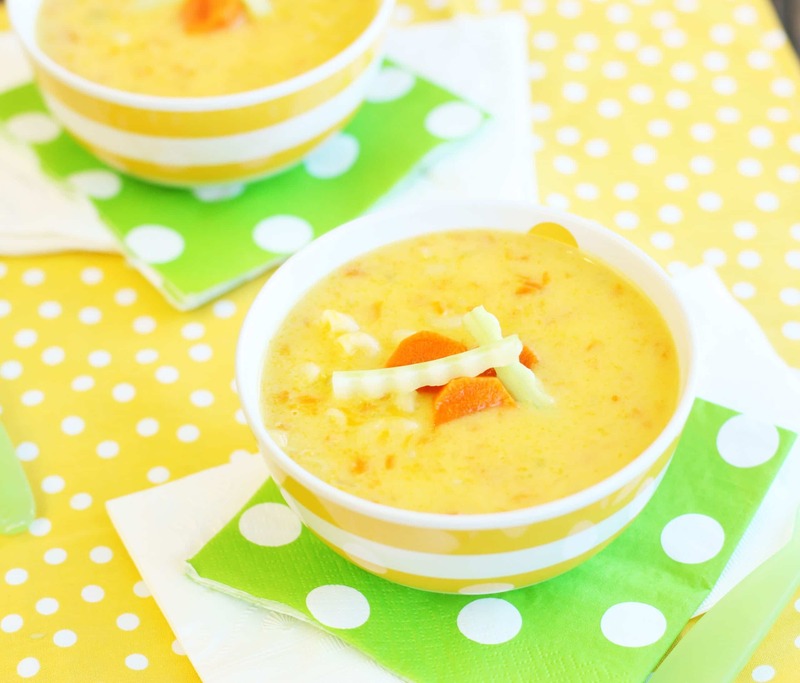 Ladle into bowls and serve warm. Do you boil the macaroni separately or just throw it in the soup uncooked and it will cook in the soup? I made this today and my 4 year old LOVED IT! It was too soupy for me, so I added more noodles and a little salt. FABULOUS! I have put this one in my KEEP IT file! It’s pretty soupy and I can’t figure out exactly why it has to be so. I’d cut the broth and water in half. Needed garlic salt and we added some butter and topped with parmesan cheese. But the kids really liked it!